I haven’t seen many to-do list managers in a while. 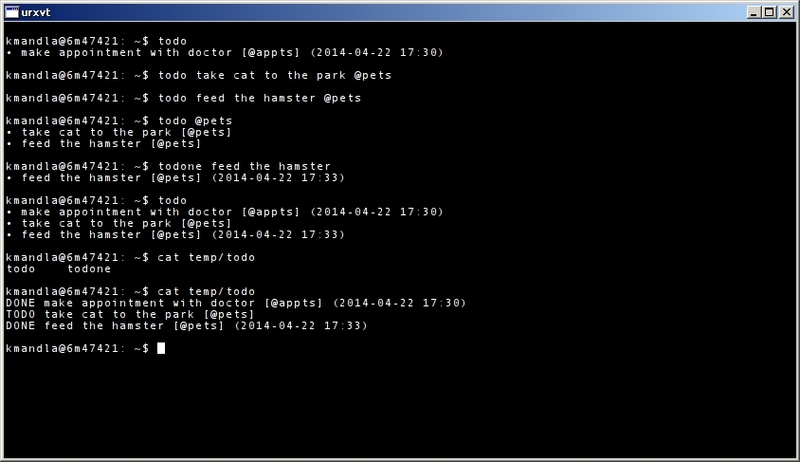 Here’s sh-todo, a simple one that runs at the command line and needs nothing more than your shell to work. Setting it up is no big trick: Move the todo, todone and todone-archive files out of the git clone folder and somewhere in your $PATH. Copy sh-todo to $HOME/.sh-todo, edit it to give it a path for your lists (the default is a Dropbox folder), and from there it’s very quick to learn. todo prints a list of what you’ve got. todo plus a task adds it to your list of things to do. todone and a task will look for a match and mark it done. And that’s 90 percent of what you might need a to-do list manager for. sh-todo can also handle tags, which means you can lump things in groups, and filter through them that way. If you want to reorder tasks, or edit them some other way, everything is stored as a text file in the folder you defined in .sh-todo. Edit to your heart’s delight. I like sh-todo for the same reason I like pass: It handles the chore in a very simple and straightforward way, without incorporating gobs of pointless dependencies and staying close to the Unixy way of doing things. On the other hand, it doesn’t have a lot of the bells and whistles of some other to-do managers, like doneyet‘s full-screen interface or ctodo‘s marvelously intuitive arrangement. But if you want something that is 99 and 44/100 percent likely to work on your machine, without drawing in clutter just to show a box, this might be for you. This entry was posted in Linux and tagged manager, task, to-do on 2014/04/23 by K.Mandla.